Based in Great Britain for most of her adult life, Barbara Tribe is one of Australia’s most significant 20th-century sculptors, recognised for her work with Rayner Hoff and for her own figurative and portrait sculptures. Tribe was born in the Sydney suburb of Edgecliff on 20 June 1913, three years after her parents migrated from England. At 15, she enrolled in a two-year intermediate art course at East Sydney Technical College (later known as the National Art School). After completing the course she was selected by sculptor Rayner Hoff to enter his three-year sculpture diploma. While studying under Hoff, Tribe completed a large body of work and assisted him on major commissions such as sculptural reliefs for the Rialto and Roxy theatres in Sydney. Most significantly, she was one of a group of sculptors employed by Hoff to assist with the major work of his career, the Anzac Memorial in Sydney’s Hyde Park. In June 1933 Tribe received her diploma with honours and was awarded bronze medal for sculpture by the college. Following her graduation, she taught art part-time there. Between 1931 and 1934, encouraged by Hoff, Tribe exhibited annually with the New South Wales Society of Artists. One of the works she exhibited in 1934 was The spirit of the sea , now in the Art Gallery of New South Wales collection. While its marine theme was influenced by her beachside upbringing and swimming at Bondi, its overt eroticism is indicative of the vitalist traditions taught by Hoff. In 1934 Tribe held her first solo exhibition, at Anthony Hordern’s Fine Art Gallery. The show, comprising her plaster sculptures, was reviewed favourably by the Sydney press. In 1935 she was awarded the New South Wales Travelling Art Scholarship. This was the first time the scholarship had been awarded to a sculptor and the first time it had been awarded to a woman. Tribe departed for London, where she studied and worked. Following the completion of the two-year scholarship she decided to stay in England, which remained her home, returning only periodically to Australia to visit friends and family. During World War II Tribe was employed by the Inspectorate of Ancient Monuments to record historic buildings vulnerable to wartime damage. In 1943 Australia House sent seven Australian airmen to pose for busts in her studio. These portraits, later cast in bronze, include Squadron Leader RH Gibbes and Rear Gunner RAAF (Warrant Officer Norman Williams) . 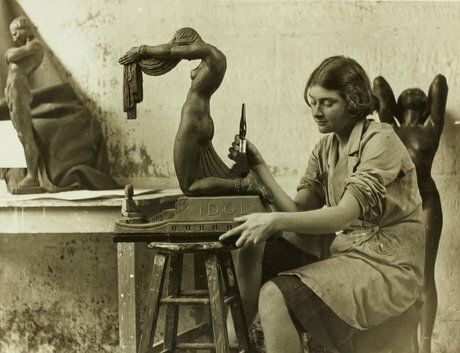 During the 1940s Tribe began to exhibit with the Royal Academy and also the Royal Society of British Sculptors, which made her a fellow in 1957. Following the war she moved to Cornwall, setting up a home and studio in Sheffield, near Penzance, with her husband, architect and potter John Singleman. She took up a position teaching modelling and sculpture at Penzance School of Art, a position she held for 40 years. While teaching Tribe continued to work and exhibit, making art well up into her eighties. In 1998 she received the Jean Masson Davidson Medal from the Society of Portrait Sculptors in London for her contribution to sculpture. She died in Penzance on 21 October 2000. Barbara Tribe’s archive is held in the Art Gallery of NSW’s National Art Archive.